Examples of trematode soldier attack and activity. Division of labour amongst social animals is usually associated with insects such as bees. Surprisingly, it also occurs amongst some members of a group of parasites known as flatworms or flukes. 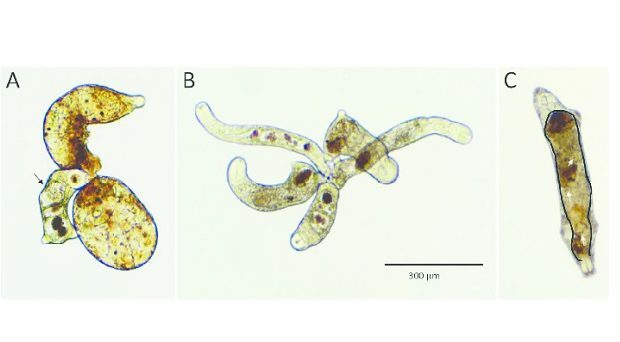 These digenean trematodes have a complex life-cycle and usually use molluscs as first intermediate hosts. Infection is initiated when a free swimming, ciliated larva, the miracidium, invades the host, metamorphoses and divides to produce a clone of offspring. In some species these are known as redia and have an operational mouth and gut and feed on host tissue. The colony continues to grow, pushing aside organs and, in some cases, filling much of the body of the host. Eventually the rediae produce the next stage in the lifecycle, the cercariae. These are shed from the host and seek a second intermediate host. If two different species of trematode invade the same mollusc, war ensues and one species of redia can predate the other. It has recently been recognised that some species of trematodes with rediae have developed a soldier caste specifically to defend the colony from such an attack. These rediae are smaller than the reproducing ones, but have a larger pharynx and are often found in areas of the host where miracidia are likely to invade. Only the soldier rediae attack newcomers. It was hypothesised that species with soldier classes would dominated those without, and dominance hierarchies have been described. Only two, closely related, families of digeneans were thought to contain species with soldier rediae but earlier this year Ana Garcia-Vedrenne and colleagues reported their study of another family of trematodes that contains species with soldier rediae. The California horn snail is a marine gastropod found in brackish water. It grows to 25mm in length and can live for 6-10 years. Eighteen species of trematodes infect the snail, so this was an ideal host with which to explore the development of species with soldier rediae. The researchers focussed on four species of trematodes belonging to the family Heterophyidae. Snails collected from the wild were identified as being infected if they were shedding cercariae. They were dissected and the species of the rediae present were identified. Rediae that did not contain germ balls or embryos were classified as soldier rediae, as opposed to reproductive rediae. 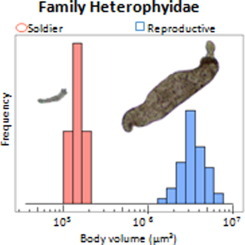 There were clear morphological differences with reproductive rediae being 28 times larger than soldiers and, whereas the reproductive rediae were largely found in the region of the gonads, the soldiers were found in the anterior regions of the snail. In order to study the development of new colonies, wild-collected snails that were uninfected were marked with paint and returned to the salt marsh for re-collection 5 months later. Any newly infected snails were then examined. Newly established colonies contained a high proportion of immature rediae and older colonies had many more reproductives than soldiers, and only a few immatures. The researchers also performed attack trials to discover which species would dominate another. This involved mixing soldier rediae from one species with soldiers or reproductive rediae from another. Although reproductives rarely attacked rediae from different species, soldier redia were seen to probe and sometimes attach their mouth to members of another colony, pulling the tegument (outer body layer) into their pharynx. Soldier rediae from two of the species examined attacked rediae from different colonies, with one species being far more aggressive than the other. Of the four heterphyid species, two were far less common than the other two in wild collected snails. This meant fewer attack trials could be performed with them and the authors suggest this may explain why no attacks were witnessed in these species. However, perhaps they should also consider they may be less aggressive, and that this could explain why they are less common in the wild. It has been hypothesised that this type of division of labour could evolve in species that parasitize long-lived hosts, as there is time for several different species to invade. The California horn snail is long-lived and can host a large number of trematode species. It had already been established that a dominance hierarchy exists within the guild of trematodes parasitizing this snail, and five of the dominant species (all in the family Echinostomatidae) have soldier rediae. This study clearly demonstrated that the existence of a caste system in trematodes occurs more widely than was previously thought. Although these four species of heterophyid trematodes are in the middle of the dominance hierarchy, the authors suggest they could kill rediae more subordinate to them in the hierarchy, and that this demonstrated that division of labour has evolved multiple times. It would be fascinating to discover what determines this aggressive behaviour and how one species of Trematode recognises another.